Looked like a slow commute to me. I wonder if he even knew they were after him before the mounted patrol appeared in front of him. Were Ponch and John available for comment? Except for the whole "Buy American" thing, there really is no reason to. CHiPs rode Kawasakis on the TV show. In the Reunion film they rode BMW motorcycles. 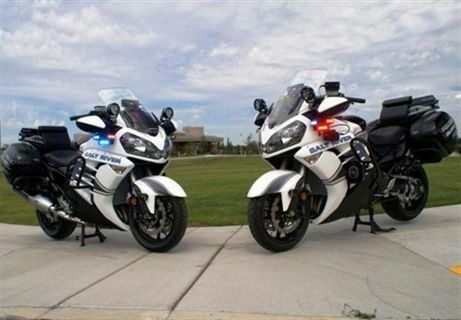 CHP has never used Harley Davidson motorcycles. It appears that's what they use now since Kawasaki stopped making their police bikes. Stevethrower's pic above is the new Kawasaki Concours 14 that will be replacing the current crop of BMW R1500 motors. The Ormond Beach police in FL bought two of those a couple years ago. They are pretty easy to spot coming at you from a distance once you get to know the profile. They look a lot better in black than the ones on the photo here.